Since 1984, the Classic bottle has been used and trusted by mums to prevent colic and keep their baby’s happy when feeding. Thirty years on and the Classic bottle has been revinvented. Introducing the Philips Avent Classic+ Anti-Colic feeding bottles. The advanced two piece anti-colic system helps your baby to control milk similarly to when being breastfed, making Classic+ easy to use when combining both bottle and breastfeeding. 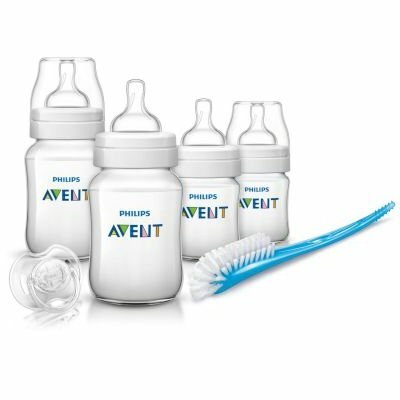 The Philips Avent Classic+ Newborn Starter set has everything you need to start bottle feeding a newborn, whether feeding exclusively with bottle or combining breast and bottle. Unlike other bottles, the clinically proven anti-colic system is now integrated into the teat. As your baby feeds, the valve on the teat flexes to allow air into the bottle instead of your baby's tummy. The Classic+ bottle is designed to prevent leakage whilst feeding, for a truly enjoyable feeding experience. The UK's original anti-colic bottle has now been reinvented to use fewer parts. The Classic+ feeding bottle is now easier to clean and assemble, ensuring you can give your baby what they need without any hassle. Have a more enjoyable feeding experience, with no leaks and only four parts to simply put together. The valve on the teat flexes to your baby's feeding rhythm. Milk will only flow at the pace chosen by your baby to minimise overeating and spit-up, burping and gas.